VeryPDF PDF Impose, also named PDF Stitch, lets you create 2-up, 4-up or n-up imposed PDF files in a quick way. With this tool, you can select pages from the original PDF and combine them together by putting these pages per sheet. VeryPDF PDF Impose can help you create imposed PDF files in batches under Mac and Windows operating systems. It provides a GUI version and a CMD version to meet different requirements of different users. You can freely manage the N-up imposed PDF page order. The following screenshots show the effects after reordering the PDF pages. VeryPDF PDF Impose provides four order options. If you choose Horizontal, the output PDF pages will be arranged as the ones in the first screenshot. If you set the PDF page stitch order as Vertical, you will get an output file with pages ordered as in the second screenshot. If you choose Horizontal Reversed as the PDF page stitch order, the output PDF pages will be arranged as in the third screenshot. The last screenshot shows the effect of the stitched page order after choosing Vertical Reversed as the order. When you place multiple pages per sheet, you can choose to retain the original page size, scale the content, or fit content to customized page size. 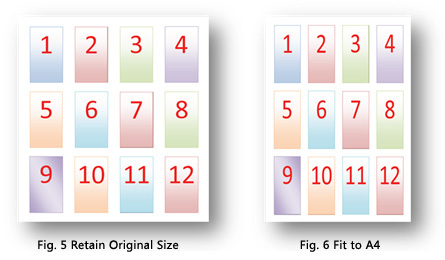 The left screenshot below illustrates the effect after retaining the original page size when make imposed PDF, while the right one displays the effect after fitting pages to A4. Place multiple PDF pages per sheet. Rotate PDF pages clockwise or counterclockwise. Define output PDF page margins. Add line between imposed PDF pages on each sheet. You can also define the line color. Set gutters for imposed PDF pages on each sheet.